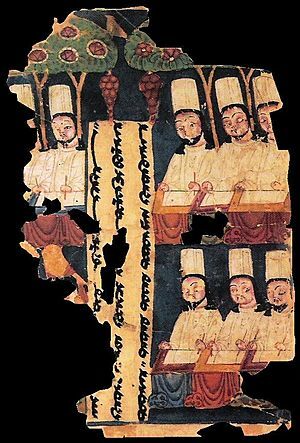 Manichaean priests, writing at their desks, with panel inscription in Uyghur. Manuscript from Khocho, Tarim Basin. Manichaeism (in Modern Persian آیین مانی Āyin e Māni) was one of the major Iranian Gnostic religions. Originally it came from Sassanid Persia. Most of the original writings of the founding prophet Mani (Syriac, ܡܐܢܝ, c. AD 210–276) have been lost, but many translations and fragmentary texts have survived. Manichaeism was big between the third and seventh centuries. At its height it was one of the most widespread religions in the world. 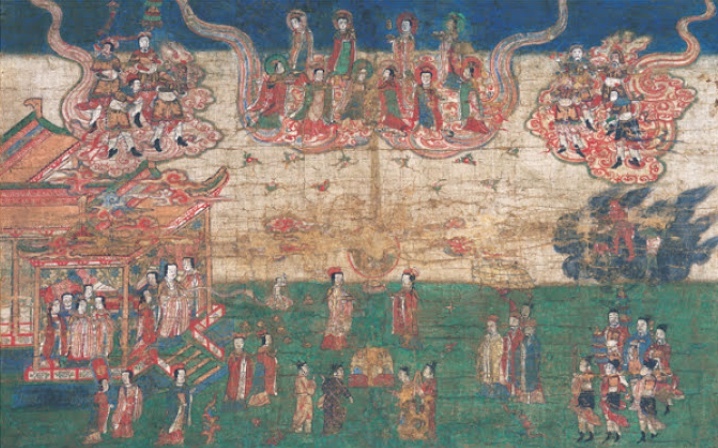 Manichaean churches and scriptures existed as far east as China and as far west as the Roman Empire. Manichaeism appears to have died out before the sixteenth century in southern China. 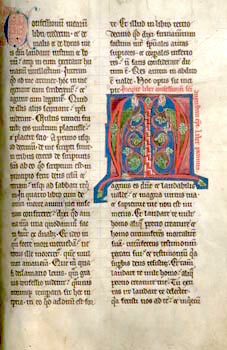 The original six sacred books of Manichaeism were written in Syriac Aramaic. They were soon translated into other languages to help spread the religion. As they spread to the east, the Manichaean writings passed through Middle Persian, Parthian, Sogdian, and ultimately Uyghur and Chinese translations. As they spread to the west, they were translated into Greek, Coptic, and Latin. 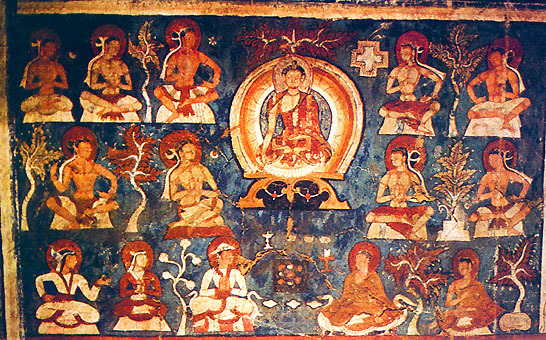 The spread and success of Manichaeism were seen as a threat to other religions, and it was widely persecuted in Christian, Zoroastrian, and later, Islamic areas. Yüen dynasty silk painting Mani's Birth. 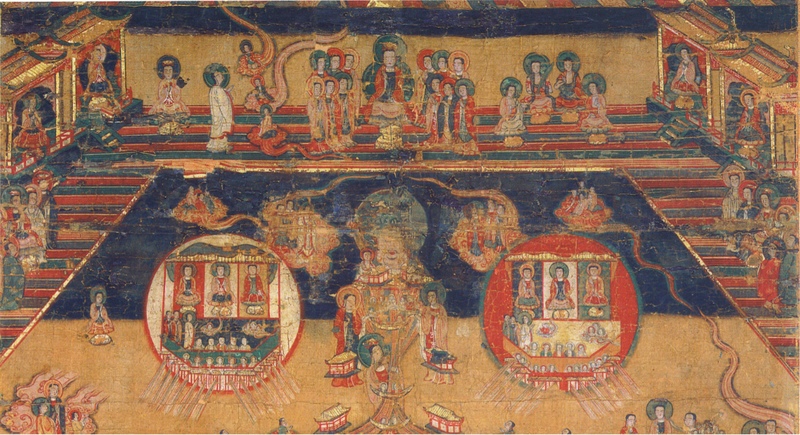 Sermon on Mani's Teaching of Salvation, 13th century Chinese Manichaean silk painting. Jesus Christ as a Manichaean prophet, the figure can be identified as a representation of Jesus Christ by the small gold cross that sits on the red lotus pedestal in His left hand. Akshobhya in his Eastern Paradise with Cross of Light, a symbol of Manichaeism. 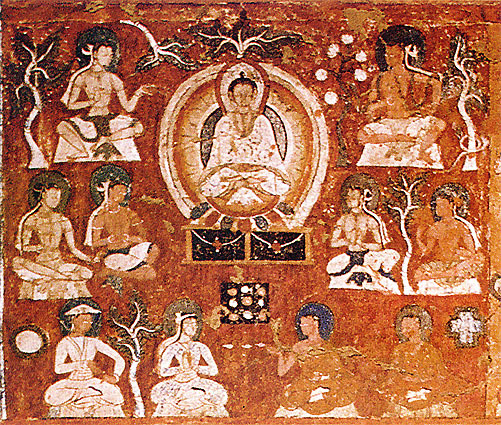 Amitābha in his Western Paradise with Indians, Tibetians and Central Asians, with two symbols of Manichaeism: Sun and Cross. An analysis on Mani’s cosmology. Manichaeism Facts for Kids. Kiddle Encyclopedia.